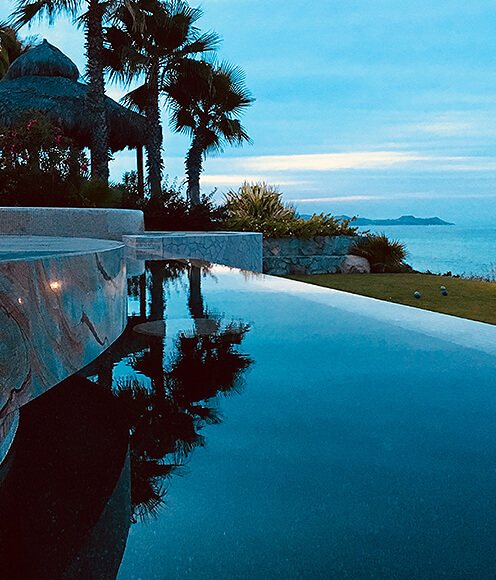 Settled at the end of the Baja California peninsula between the Sea of Cortez and the Pacific Ocean, Los Cabos has grown from sleepy fishing village into one of the premier vacation destinations in the world. Though popular as an exclusive getaway with Hollywood Elite since the '50's, the area has become more accessible and more appealing to people with all sorts of interests. World-class beaches, fishing, and golf courses; fine dining and night life; ecotourism and water sports; art and culture; music, film, and food festivals; and major sporting events are just a handful of things that await first-time visitors. The incredible warm weather and culture of Mexico are what welcome them back. From beautiful beaches to world class fishing and water sports, Los Cabos has attracted new and return visitors for years. With almost guaranteed sunshine year round it's a favorite destination for major events and weddings alike. Food, Art, Music, Film, Night life, Historic Culture, Ecotoursim, and much more, it's no surprise that Los Cabos has grown to become one of the top picks for paradise-seekers world wide.